Life calls for lush wears. 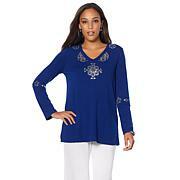 This beautiful top gives you sumptuous velvet and pretty lace so your look always leans towards luxurious. Pair it with shorts, skirts or slacks for a bit of effortlessly extravagant style. I ordered the gray in a large and it fit perfect. Looks so expensive. Glad I ordered it. I really like her tops but this one ran a bit tight but keeping it! Time for diet any way! Smiles! Very pretty top! Can wear to church or just our for dinner! This velvet beauty is a vision. Got the blue one and the lace makes it very special. Fits true to size, close to body but perfect on XL figure. I love the length, simply perfect with my navy faux leather leggings! A bargain!! Love this top. Purchased in 3X, wanted to be sure stomach area was covered and length didnt stop mid-stomach with arms raised or not. Not too heavy, can be worn with casual or formal bottom half. Important to me, since length is important. Lace adds just amount of dazzle. Could wear to work, depending upon environment, lace should receive care. Not very delicate, still lace requires special care. Reversible capabilities nice.